Shop our products featuring Elizabeth. This true story has it all: intrigue, romance, comedy, tragedy, and medical and psychological breakthroughs. It is a story about an extraordinary woman struggling to live an ordinary life, until destiny intervened and urged Elizabeth Layton to begin a wondrous healing journey. A happy ending for sure, but oh what a journey to that end! 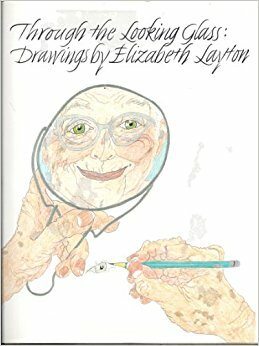 This 360-page, soft cover, full-color memoir/ biography is filled with photographs and drawings that illustrate Elizabeth's life story - most of which is in her own words (printed in green, the color of her beautiful eyes). $20 Plus Shipping and Handling of $4 plus sales tax for Kansas residents. This true story has it all: intrigue, romance, comedy, tragedy, and medical and psychological breakthroughs. It is a story about an extraordinary woman struggling to live an ordinary life, until destiny intervened and urged Elizabeth Layton to begin a wondrous healing journey. A happy ending for sure, but oh what a journey to that end! This is now available in PDF form for $5.97 (plus tax for KS residents). Instructions: After payment is made, simply click the "Return to Elizabeth Layton link, that will take you to the Signs PDF link - don't forget to save the PDF to your computer. a poem and drawing by Elizabeth Layton. A powerful piece, this poem expresses the grief and hopes of motherhood, describing events and mothers both unsung and renowned. Now available in PDF form for $2.99 plus tax (Kansas residents). Instructions: After payment is made, simply click the "Return to Elizabeth Layton link, that will take you to the Lullaby PDF link - don't forget to save the PDF to your computer. 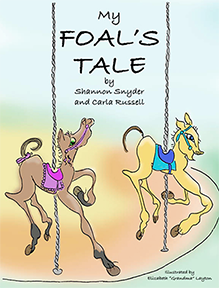 My Foal's Tale is an enchanting paperback baby book for Horses! Delightfully illustrated by Elizabeth "Grandma" Layton, with 26 pages for record keeping, photos, notes, and more! The book is $10 plus $3 Shipping and Handling plus sales tax for Kansas residents. 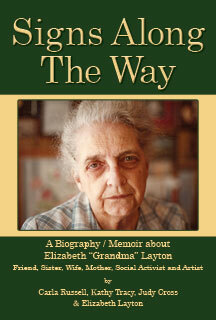 The first book about the art and life of Elizabeth Layton is now available. It reproduces 40 of her early drawings. Copies can be ordered for $15 each, which includes postage. Send check or money order to: Don Lambert, 4232 Holly, Apt. 1, Kansas City, Missouri 64111.